Still getting used to working a normal five day work week. It’s been so long, but I’m not complaining. I’ve done alright in the interim. The thing that full time employment has really changed is our date night. We chose to do carry-out Saturday night and just cooked appetizers from a box on Sunday so if we were going to eat out this week, it was going to be lunch on Monday. I was really wanting a burger. Surprisingly, it’s been quite a while since I’ve actually had one and J was alright with pub food. I had picked a place we had never been then checked reviews on Urbanspoon and there were a couple recent bad ones, so we decided to go somewhere else. 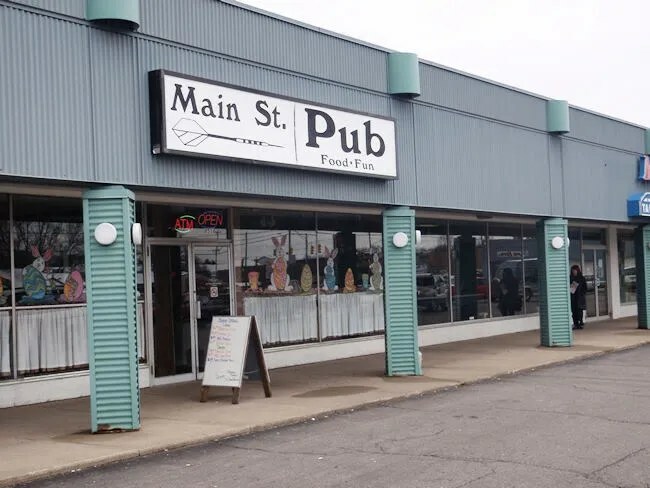 Not sure why it popped in to my head, but Main Street Pub was the place I thought of. We have always had good experiences at all of the Housler restaurants so I knew it was a pretty safe choice. 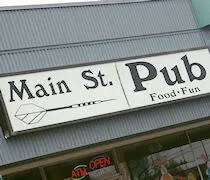 The closest Main Street Pub location to us is the only one actually in the city of Kalamazoo and only one of two actually on Main Street. It’s actually a little hard to see from busy West Main. The restaurant is in the shopping center just to the east of Drake Road in the Westwood neighborhood. We were a little after the lunch rush which is pretty normal for us yet there were still a few other tables just sitting down as we walked in. The dining room is really small in comparison to the other locations I’ve been to. The space is divided by a wall with the bar being in the space farthest from the entry. We grabbed a booth along the interior wall and a waiter followed us over to take drink orders. I got a Pepsi while J went with an Iced Tea. The menus are already on the table in the form of place mats so we started looking them over as the specials were explained to us. When our drinks arrived, we were ready to order. I was somewhat interested in one of the specials which was called a KBL Burger, but I didn’t really know what that meant. When I asked, I didn’t get a very good explanation. Just that it had a KBL sauce…not really sure what that is, so I passed and stuck with something I know and like. I ended up ordering the 3-B’s Burger. 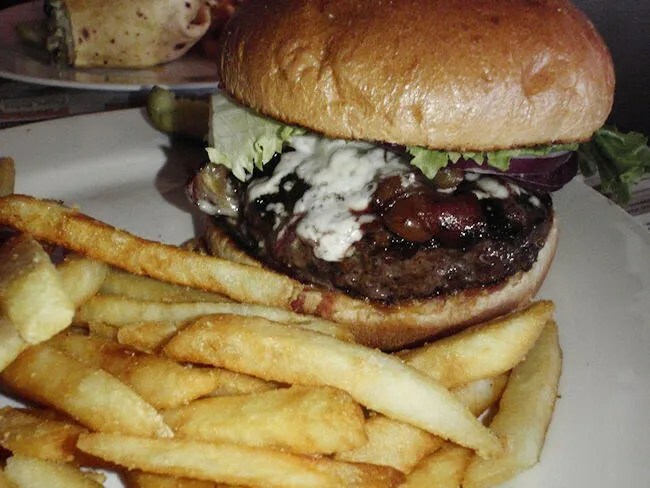 The three “b’s” Burger. Bacon. Bleu Cheese. I got the sandwich cooked medium and it came out perfectly juicy. I like that they use actual bleu cheese crumbles instead of a sauce like some places do. The bacon was nice and crispy and the bacon grease (and yes, I know how this sounds, but it’s soooo good), mixed with the bleu cheese to give it a smokey tangy flavor. The sandwich came with pub fries which were lightly salted and cooked crispy on the outside, but soft in the middle. J’s pick was the Southwestern Chicken Wrap. The Jalapeno-Cheddar wrap was filled with grilled chicken breast, a spicy black bean dip, lettuce and shredded cheese. She like the dip over some kind of sauce because it made the sandwich a lot cleaner and a lot easier to eat. The wrap was so big she could only handle half of it and brought the other half home for lunch tomorrow. 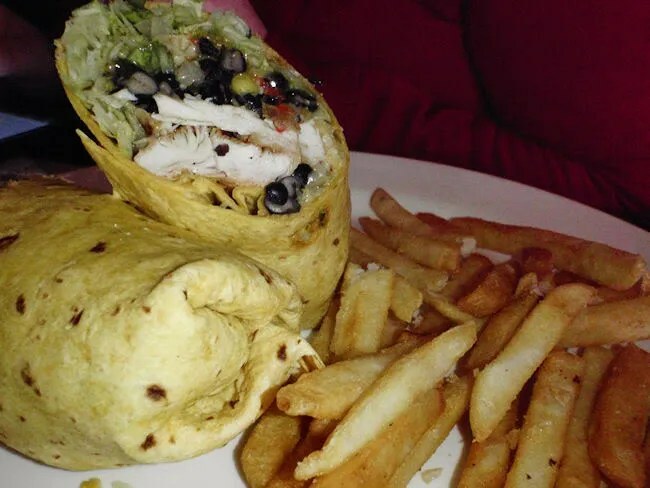 Her wrap also came with pub fries which she had no problem taking care of. Our bill was just a bit over $20. Main Street Pub delivered yet again. We’ve yet to have a bad meal from any of the local chain’s offerings. Main Street Pub is always a good go-to spot for us and I’m sure this is not the last time I will say that.